Home » Posts Tagged "Frazzle"
At the beginning of December, Art Basel takes over Miami. “The goal is to connect the world’s premier galleries and their patrons, as well as serving as a meeting point for the International Art World.” Here are Marissa G. Boyescu’s “photos on the run” from some of the events she attended as an Artist Agent/Broker. Included, The Big Show Fair Preview – Art Basel/Miami/Beach – The VIP Opening Brunch for Pulse, First Choice Opening, The Scope Art Fair, Miami Projects Art Fair, Bass Museum Sculpture Garden, INK. Top Left to Right : London’s flamboyant Daniel Lismore has a 3,000 piece wardrobe according to Vogue. He is an eccentric, artist, designer, performer, seen here in Hot Headgear … a hot hat … and in an artful mini … Art and Love dress tells the story. 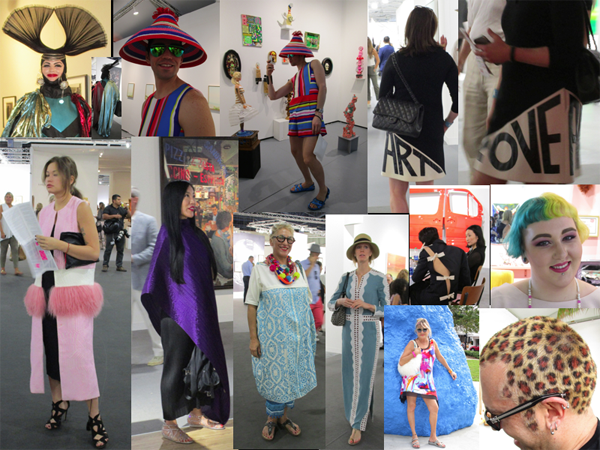 Bottom Left to Right : A stand-out fab pink outfit … Purple Art Caftan … Charo Oquet, a local artist/curator from the Dominican Republic in blue and white with colorific necklace … Blue and white long folk dress with hat … Three white bows fasten the back, chicly showing plenty of skin … Budding Hyper Queen, Katie Rauth, a multi-disciplinary artist based in Philadelphia with half turquoise half yellow hair. She helped Erica Prince with an interactive installation called the Transformational Makeover Salon (they were doing hair and makeup in their booth) … Veronicka Koebach, a “blonde painter” – with pinks in her blonde updo. She is standing in front of Ugo Rondinone’s blue sculpture, just purchased by the city for 7 figures – at the Bass Museum Sculpture Garden … Joshua Levine, a Miami artist, has had this leopard hair for about twenty years – ©1972, his logo, is tattooed on his neck at the back.